Effect of powder-liquid ratios and powder colors on color stability of 4-META / MMA-TBB resin after immersion in coffee. The aim of this study was to evaluate the color stability of 4-methacryloxyethyl trimellitate anhydride (4-META) / methyl methacrylate (MMA) & tri-n-butylborane (TBB) resin with different powder-liquid (P/L) ratios and powder colors after immersion in coffee. Experimental groups (Bondfill SB) were classified by the P/L ratio (0.8:1 / 1:1 / 1.2:1, weight [wt] %) and color of the powder (light / medium). Light-cured resin composite (Filtek Z350 XT flowable) was used as a control group. Each disk-shaped specimen of 7 groups (n = 8 for color difference, n = 10 for translucency parameter [TP]) was immersed in a staining solution of coffee for 4 weeks. The color of the specimen was measured at the time of baseline, 1 day, 1 week, 2 weeks, 3 weeks, and 4 weeks with a spectrophotometer. The color difference (ΔE) and changes in translucency parameter (ΔTP) were statistically analyzed by one-way analysis of variance (ANOVA), followed by Tukey’s post-hoc test. Independent t-test was applied to evaluate the effect on the colors of the powder (α = 0.05). 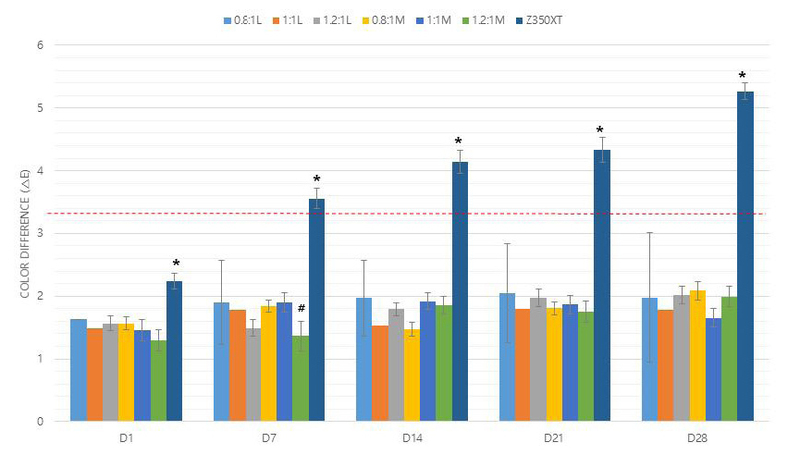 The values of color difference (ΔE) of the experimental groups were within the clinically acceptable threshold (ΔE < 3.3), whereas control group showed values over 3.3 after 1 week of immersion. The values of TP ranged from 9.58 to 13.28. The differences of TP (ΔTP) between baseline and 4 weeks were less than 1.0, except in the control group. Conclusively, self-cured resin composite showed excellent color stability in coffee for the period of this study regardless of different P/L ratios and powder colors. 본 연구의 목적은 4-methacryloxyethyl trimellitate anhydride (4-META) / methyl methacrylate (MMA) & tri-n-butylborane (TBB) resin을 커피에 침전했을 때 서로 다른 분말-액 비율과 분말의 색이 색 안정성에 미치는 영향을 알아보는 것이다. 실험군(Bondfill SB)은 분말/액 비율(0.8:1 / 1:1 / 1.2:1, 질량 %)과 분말의 색(light / medium)의 조합에 따라 설정되었고, 광중합형 복합 레진(Filtek Z350 XT flowable) 이 대조군으로 사용되었다. 총 7개 군(n = 8 for color difference, n = 10 for translucency parameter)의 디스크 모양 시편은 4주 동안 커피에 침전되었다. 시편의 색은 기준점, 1일, 1주, 2주, 3주, 4주 후에 각각 분광 광도계(spectrophotometer) 를 이용하여 측정되었다. 색차(color difference, ΔE)와 반투명도 차이(changes in translucency parameter, ΔTP)는 통계적으로 일원분산분석 및 Tukey 사후 검정을 이용해 분석하였다. 분말의 색이 미치는 영향은 독립표본 T 검정을 사용하여 평가하였다(α = 0.05). 실험군의 ΔE 값은 임상적으로 받아들일 수 있는 수준이었던 것에 비해(ΔE < 3.3), 대조군은 침전 1주부터 3.3 이상의 ΔE 값을 보였다. TP 값은 9.58에서 13.28 사이에 분포하였다. 4주 후 ΔTP 값은 대조군을 제외하고는 1.0 이내에 존재하였다. 결론적으로, 자가 중합형 복합 레진은 본 실험의 기간 동안 커피에 침전 시, 서로 다른 분말-액 비율과 분말의 색에 관계없이 훌륭한 색 안정성을 보였다. Ideally, esthetic restorations should mimic the appearance of natural teeth with respect to color, translucency, transparency, opalescence, and fluorescence (Shin & Rawls, 2009; Arocha et al., 2013). However, with persistent exposure to oral environment, discoloration of resin restorations occurs, and is one of the major disadvantages of resin restorations (Patel et al., 2004; Ertas et al., 2006). Esthetic failure including unacceptable color match is reported to be one of the most common reasons for replacement of resin restorations (Abu-Bakr et al., 2000). The success of esthetic resin-based restorations is closely related to their color stability. Discoloration of resin restorations may be caused by intrinsic or extrinsic factors (Sham et al., 2004; Sarafianou et al., 2007; Samra et al., 2008). Intrinsic factors are materials-related factors such as the composition of the resin matrix and filler, the loading and particle size distribution of the filler, the type of photoinitiator and polymerization systems, and the conversion ratio of the carbon-carbon double bonds (Schneider et al., 2008; Shin & Rawls, 2009; Falkensammer et al., 2013). Extrinsic factors are related to the adsorption or absorption of staining from exogenous sources frequently related to food components, beverages, or smoking habit (Patel et al., 2004; Sham et al., 2004; Shiozawa et al., 2015). Beverages including wine, coffee, and tea have been known to affect discoloration of resin restorations (Topcu et al., 2009). In MMA-based self-cured composite resins, a MMA powder was polymerized using a chemically activated initiator (benzoyl peroxide with N,N-dimethyl-p-toluidine, BPO/DMPT), light activated initiator (camphoroquinone with N,N-dimethylaminoethyl methacrylate, CQ/DMAEMA), or TBB (Taira & Imai, 2014). MMA/TBB resin was first introduced with successful clinical trial in 1968 (Taira & Imai, 2014). With a long history of clinical trials, self-cured resin (4-META/MMA-TBB) consisting of 4-META, MMA, poly(methyl methacrylate) (PMMA), and TBB has been used widely in clinics as reliable material. The recently developed 4-META/MMA-TBB resin was modified to contain pre-polymerized organic filler particle (Bondfill SB, Sun Medical, Moriyama, Japan), as compared to the previous 4-META/MMA-TBB resin (Super-Bond C&B, Sun Medical, Moriyama, Japan) with no organic filler. The manufacturer claimed that this recently developed 4-META/MMA-TBB resin with high color stability is useful for restoration in tooth wear such as attrition and repair of margins of restorations with defects or secondary caries. The color behavior of self-cured 4-META/MMA-TBB resin can be completely different as compared to light-cured composite resin because of their different compositions and relate factors. However, there have been no studies regarding the color stability of this self-cured resin, in contrast to the abundant studies on light-cured composite resins (Calheiros et al., 2013; Gujjari et al., 2013; Shiozawa et al., 2015). Meanwhile, because of the unique application method, the so-called ‘brush-dip technique’, clinically applied P/L ratios of this resin material can vary in each situation. This technique involves soaking the brush in activated liquid and then dipping it into the powder to form a ball of powder on the tip for application in the cavity and repeating this procedure several times to give appropriate form to the restoration. Additionally, the shade of this self-cured resin is controlled by using different colors of the powder (light / medium) provided by the manufacturer. These factors may change the composition of the resin matrix and/or filler and affect the color stability. Therefore, the aim of this study was to evaluate the effect of different P/L ratios and colors of powder on the color stability of 4META/MMA-TBB resin after immersion in coffee, by measuring the color difference and change of translucency using spectrophotometry based on the Commission Internationale de l’Eclairage (CIE) L*a*b* color system. The null hypothesis tested was that the color stability of self-cured 4-META/ MMA-TBB resin composite is not affected by its P/L ratio and powder colors after immersion in coffee. Experimental groups (n = 8) were divided according to 3 P/L ratios (0.8:1 / 1:1 / 1.2:1, wt %) and 2 powder colors (light [L] / medium [M]); each group was named as follows: 0.8:1L, 1:1L, 1.2:1L, 0.8:1M, 1:1M and1.2:1M. light-cured resin composite (Filtek Z350 XT flowable, shade A3, 3M ESPE, St. Paul, MN, USA) was used as the control group (Z350XT). A different P/L ratio was calculated by regulating the powder (wt %) with same liquid (wt %). All the materials used in this study are displayed in Table 1. Fifty-six disk-type samples (n = 56) of each resin materials were prepared using custom made acrylic molds for 7 groups (each group, n = 8). The molds were held between 2 glass slides, each one covered with a transparent polyester strip (Mylar, DuPont, Wilmington, Del., USA). The slides were gently pressed together to remove excess material. The diameter of the specimen was 6 mm and the height 2 mm. light-cured composite resin specimens were polymerized by a LED light-cure lamp (Elipar S10, 3M ESPE, Munich, Germany) for 40 seconds and the self-cured composite resin specimens were left to dry for 30 minutes at the room temperature to allow self-cured polymerization. All specimens were stored for 48 hours in distilled water at 37±2℃, prior to measurement. Following this, the specimens were wet-ground with 600-, 800-, 1000-, 1200-, 1600-and 2000-grit silicon carbide abrasive papers (Mark V Laboratory, East Granby, Conn., USA) in series to obtain flat surfaces and to avoid disturbances from oxygen-inhibited layers. A coffee solution of 1.1 g of coffee (Maxim original, Dongsuh Foods, Seoul, Korea) mixed with 100 ml distilled water at room temperature served as the staining solution in this study. All specimens were supplied with 10 ml of the staining solution and stored in a 37℃ water-bath. The staining solutions were renewed daily to avoid bacterial or other contaminations. Before the color measurement, the specimens were rinsed with 10 ml distilled water and dry blotted with tissue paper. Color measurements were performed before the immersion in staining solution for baseline color measurements (D0), and after staining at day 1 (D1), 1 week (D7), 2 weeks (D14), 3 weeks (D21) and 4 weeks (D28) using spectrophotometer (NF999, Nippon Denshoku, Tokyo, Japan) based on the CIE L*a*b* color system. The measurements were repeated 3 times for each specimen. Seventy disk-type samples (n = 70) of each resin materials were prepared using custom made acrylic molds for 7 groups (n = 10). The diameter of the specimen is 6 mm and height was 1 mm. The process of specimen preparation, staining procedures, and color measurements were performed similar to that mentioned above. The subscripts ‘B’ and ‘W’ refer to the color coordinates over a black and white back ground. The values of change of ΔTP were obtained by calculating the change of values between the specimens before (D0) and after immersion in staining solutions for each of the periods (D1, D7, D14, D21 and D28). To evaluate the effect of different P/L ratios, the groups with same powder colors (i.e., 0.8:1L, 1:1L, 1.2:1L) were analyzed; whereas, for the evaluation of the effect of powder colors, the groups with same P/L ratio (i.e., 0.8:1L, 0.8:1M) were statistically analyzed. One-way ANOVA was performed to investigate the significant differences among all groups and effect of different P/L ratios. The means were compared by Tukey’s post-hoc test. Independent t-test was applied to evaluate the influence of different powder colors. In all the analyses, the level of significance was set at α= 0.05. The data was evaluated using the SPSS Software (PASW Statistics 20, SPSS Inc., Chicago, IL, USA). The mean ΔE values of the evaluated materials after immersion in the staining solutions are represented in Table 2, Figure 1. The color difference represented by ΔE was almost steady in the experimental groups for the experimental period, whereas, in the light-cured resin composite group (Z350XT group) used as control, the ΔE increased gradually over the period. At D7 of immersion in staining solution, the mean ΔE values obtained from the control group were above 3.3, which is regarded as an unacceptable threshold in clinics (Patel et al., 2004). △E values for all of the groups at the different measurement time. The values of △E >3.3 are considered as clinically unacceptable color difference. *,# Indicate the significant differences among all groups (p < 0.05). In the groups of light or medium powder color, none of them had statistically significant differences regardless of the P/L ratios in the value of ΔE, except for the group of light powder at D14. For the evaluation of the effect of the color of powder, the groups with same P/L ratios were analyzed and showed no significant differences. The mean, standard deviations, and significance of ΔTP values of all groups are described in Table 3, Figure 2. If the value of ΔTP is smaller, it could be assumed that translucency of material decreased as compared to baseline. There were no significant differences among the groups until D21 of immersion. However, at D28 of immersion, the TP of the Z350XT group significantly decreased as compared to that of the 0.8:1M group. All the values of decreased TP were less than 1.0 compared to baseline, except for the value of the group Z350XT at D28 of immersion. △TP values for all of the groups at the different measurement time. *,# Indicate the significant differences among all groups (p < 0.05). In the groups of light or medium colored powder, the effect of P/L ratio was investigated and none of the groups showed statistically significant differences, except for the values at D28. Additionally, there were no significant differences in all groups with the same P/L ratios and different powder colors. It could be concluded that the different P/L ratios and colors of powder did not affect the TP of experimental self-cured 4-META/MMA-TBB resin composite in this study. The null hypothesis was accepted in this study. The 4-META/MMA-TBB resin showed high resistance to discoloration susceptibility and excellent color stability, regardless of different P/L ratios and colors of powder, during the simulated 4 weeks of immersion in coffee. According to a previous study, 24 hours of staining time in vitro corresponds to approximately 1 month in vivo. The experimental period of 4 weeks of immersion in coffee could be equivalent to about 2.5 years of clinical aging time (Ertas et al., 2006; Arocha et al., 2013). The spectrophotometer device based on the CIE L*a*b* system was used to measure the color differences for a quantitative color assessment (Hersek et al., 1999; Ardu et al., 2010), leading to reproducible and statistically utilizable results without potential subjective errors by the naked eye (Kolbeck et al., 2006; Fontes et al., 2009). In most studies, acceptable ΔE in dental materials is assumed to be less than 3.3 (Kolbeck et al., 2006; Moon et al., 2015). For the experimental groups in this study, the ΔE values of all groups after immersion of 4 weeks were static and less than 3.3, regardless of the P/L ratio or color of the powder, whereas, the control group showed clinically unacceptable color differences after 1week of coffee solution immersion. In addition to color, translucency is one of the important properties evaluating the esthetic outcomes in restoration (Imamura et al., 2008). Common value of TP of composite resins after polymerization have been reported to range from 3 to 18 (Imamura et al., 2008). In the present study, all values represented even after 4 weeks of immersion were within the range of TP. The ΔTP between the baseline and after 4 weeks of immersion in the coffee solutions were less than 1.0, whereas in the control group it was 1.37 at D28 of immersion. Among the commonly consumed drinks in the daily diet, coffee has been known to have a high potential to stain resin restorations (Kolbeck et al., 2006; Fontes et al., 2009; Arocha et al., 2013). Coffee has been frequently used as immersion solution in many studies to evaluate the color stability of esthetic restorations. It is reported that discoloration by coffee solution was caused not only by the adsorption of its yellow colorants onto the surface, but also by absorption into the sub-surface organic phase of materials. This was due to the affinity of yellow colorants to the polymer network (Um & Ruyter, 1991; Topcu et al., 2009; Ardu et al., 2010). If a composite resin can absorb water, water-soluble polymer compounds such as yellow or brown colorants in coffee could be more likely to be absorbed, resulting in composite discoloration (Bagheri et al., 2005; Arocha et al., 2013; Gujjari et al., 2013). Dietschi et al. showed that among several preconditions, water absorption is strongly related to discoloration (Dietschi et al., 1994; Kolbeck et al., 2006). Composite resin restorative materials undergo physical changes during polymerization reaction and following interaction with the wet oral environment. Excessive water absorption causes expansion and plasticizing of the resin matrix leading to monomer leaching and hydrolization of the interfacial filler-matrix silane layer and filler particles, producing microcracks or microvoids that allow stain penetration. This process may decrease the discoloration resistance and longevity of restorations (Yap et al., 2000; Sarafianou et al., 2007). It has been reported that the type of resin matrix and filler particles’ size and distribution could affect the degree of water absorption and discoloration of the composite resin. The compositions of materials tested in this study were completely different from each other. The light-cured composite resin (Filtek Z350 XT flowable resin) is composed of resin matrix including Bis-GMA, UDMA and TEGDMA with filler of zirconia and silica (47 volume %). On the other hand, the self-cured composite resin (Bondfill SB resin) contains resin matrix including 4-META, MMA and PMMA, and TMPT pre-polymerized filler (1.2 volume %) as informed by the manufacturer. As a known hydrophilic monomer, TEGDMA absorbs the highest amount of water among the used monomers. Bis-GMA contained resin showed low water absorption than TEGDMA contained resin, but presented higher water uptake than UDMA and ethoxylated bisphenol A dimethacrylate (Bis-EMA) based resin (Tanthanuch et al., 2016). In the 4-META/MMA-TBB resin evaluated in this study, the hydrophobic MMA monomer served as the solvent for 4-META and PMMA. This system was reported to exhibit very low water absorption due to the hydrophobic and single nature of the matrix (Ertas et al., 2006; Aoki et al., 2011). Additionally, this system includes low silane layer from low filler content. It has been suggested that high proportion of silane may be attributed to the higher value of discoloration of composite resin because the silanization of filler particles is also related to the water absorption level (Rueggeberg & Craig, 1988). With low silane layer content, single composition of hydrophobic polymer after polymerization might have a positive effect on the color staining resistance of the 4-META/MMA-TBB resin used in this study (Arocha et al., 2013). Furthermore, the initiator system could have an impact on the composite color stability (Fontes et al., 2009). Residual camphoroquinone (CQ), a solid yellow compound that remains unreacted after polymerization, has been considered to be responsible for the undesirable ‘yellowing effect’ (assessed through the b-value shift of the CIE L*a*b* color system) on the final aesthetic appearance of the cured material (Rueggeberg & Craig, 1988; Schneider et al., 2008; Shin & Rawls, 2009). Meanwhile, Taira et al. reported that among the initiators for MMA, the features of the TBB initiator system were quite different from those of the BPO/DMPT and CQ/DMAEMA initiator systems (Taira & Imai, 2014). They stated that the use of TBB led to a lower amount of residual monomer and a gradual decrease in the polymerized MMA resin, over a long period of time (Taira & Imai, 2014). Absence of CQ and decrease of residual monomer through gradual polymerization might be one of the related factors with respect to the resistance to the discoloration susceptibility of self-cured composite resin. Within the limitations of this study, it may be concluded that the P/L ratios and powder colors did not affect to the color stability of 4-META/MMA-TBB resin in coffee. All values of the experimental groups were within the range of the clinically acceptable threshold. The excellent color stability of 4-META/MMA-TBB resin may contribute to satisfactory clinical outcomes in esthetic restorations. Ardu, S, Braut, V, Gutemberg, D, Krejci, I, Dietschi, D, Feilzer, AJ, (2010), A long-term laboratory test on staining susceptibility of esthetic composite resin materials, Clin Oral Investig, 41, p695-702. Gujjari, AK, Bhatnagar, VM, Basavaraju, RM, (2013), Color stability and flexural strength of poly (methyl methacrylate) and bis-acrylic composite based provisional crown and bridge auto-polymerizing resins exposed to beverages and food dye: an in vitro study. India, J Dent, Res 24, p172-177. Topcu, FT, Sahinkesen, G, Yamanel, K, Erdemir, U, Oktay, EA, Ersahan, S, (2009), Influence of different drinks on the colour stability of dental resin composites. Eu, J Dent, 3, p50-56. Um, CM, Ruyter, IE, (1991), Staining of resin-based veneering materials with coffee and tea, Clin Oral Investig, 22, p377-386. Yap, AU, Low, JS, Ong, LF, (2000), Effect of food-simulating liquids on surface characteristics of composite and polyacid-modified composite restoratives, Oper Dent, 25, p170-176. *,# Indicate statistically significant difference (in columns) among all groups (p < 0.05). A,B Indicate statistically significant difference (in columns) among the groups of different powder-liquid ratios with same color of powder (p < 0.05). There was no statistically significant difference (in columns) among the groups of different colors of powder with same powder-liquid ratio (p < 0.05). a,b,c Indicate statistically significant difference (in columns) among all groups (p < 0.05).